Blocks & Construction Play :: Smart Toys and Games, Inc. 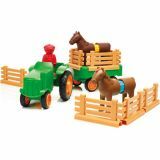 Catalog Home > Blocks & Construction Play > Smart Toys and Games, Inc. 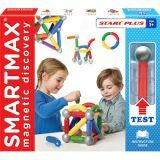 BRAND: Smart Toys and Games, Inc.
Young children (+18 months) can safely discover the magic of magnetism with the SMARTMAX® “My First”-collection. The extra-large train and animal parts easily click onto the bars. Build & drive your own train, play with the animals and the train driver or “mix & match” to create the craziest combinations! 22 pieces. All parts are 100% compatible with all other SMARTMAX® sets. Young children can safely discover the magic of magnetism with the all-new “My First” collection. Build & drive your own train, play with the animals and the conductor or “mix & match” to create the craziest combinations! Extra-large, soft touch parts easily click onto SmartMax® bars, and are 100% compatible with all other SmartMax® sets. 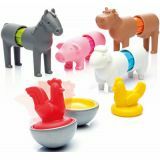 Includes horse, cow, sheep, pig, chicken and rooster. 16 pieces. Includes tractor, farmer, and 2 horses. 22 pieces. Young children (+12 months) can safely discover the magic of magnetism with the SMARTMAX® “My First”-collection. 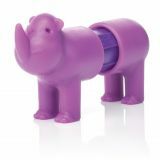 The extra-large, soft touch animal parts easily click onto the bars. Make 6 different Safari animals or “mix & match” to create the weirdest combinations! 18 pieces. All parts are 100% compatible with all other SMARTMAX® sets. Magnetic building set features pieces to build ball run sets! Both the lid and the bottom of the sturdy storage unit offer unique building grids to help you on your way to building original and colorful structures. All parts can be combined with existing SmartMax® sets. Includes colorful building guide. 44 pieces. 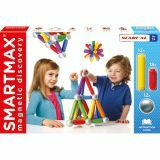 Build the ultimate ball track with this new SMARTMAX® magnetic construction set that contains an amazing 77 pieces! With endless options you can make all kinds of crazy machines and let the balls roll. 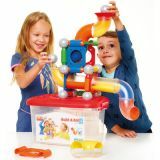 Mega Ball Run contains special parts including tubes and X-shaped bars with 4 magnetic ends. All parts can be combined with all existing SMARTMAX® sets, creating an endless range of possibilities! Includes: 14 medium bars, 4 long bars, 4 XL bars, 4 X-bars, 24 metal balls, 9 panels with holes, 5 curved tubes, 1 ramp, 3 funnels, and 3 straight tubes. The strongest and safest magnetic construction system available! 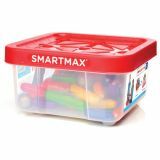 SmartMax is the magnetic discovery system that enables children, even from a very early age, to experience both the wonders of magnetism and the fascinating principles of architectural construction in a safe way. Extra-large pieces are easy for small hands to manipulate. Magnets can carry 60x their own weight, and have the ideal strength for easy assembly and break-down of constructions. Colorfully-illustrated booklets in each set present the basics of magnetic phenomena, ways to strengthen structures, steps in building towers and bridges, and construction projects from easy to advanced. Children thrive on the creative satisfaction of dreaming up their own wonderfully imaginative magnetic assemblies! Ages 3 and up.